Steep these dried blossoms in hot water to make the most beautiful beverages you'll ever drink. Steep these dried rose and lotus blossoms in hot water to make unique floral teas—and the most beautiful beverages you'll ever drink. Smell the steam from a hot cup of rosebud tisane, then take a sip of its elegant flavor: sweet and tart notes with a well-rounded floral finish. Or, inhale the honeyed aroma of the lotus flower tisane and take a sip of its golden, heady liquor. Grown only in a single plantation adjoining a Buddhist temple, these golden flowers float serenely in still waters, awaiting their moment with you. 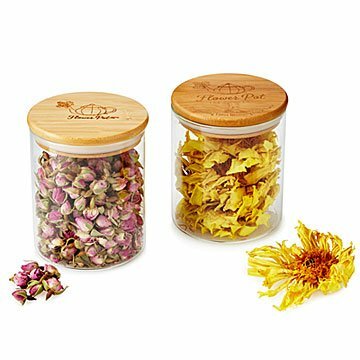 The blossoms are packaged in glass containers and make gorgeous gifts. Flowers grown in China. Steep the flower blossoms with our Glass Teapot & Warmer to revel in their floral delight. The rosebuds make approximately 27 pots of tea, and the lotus blossoms make 8-10 pots of tea. Each flower can be steeped more than once, if desired. Bought for my best friend as a birthday present, along with the lotuses. The little rose blossoms were so delicate, and when you pour the hot water over them, they're absolutely enchanting! She said they tasted like Heaven! Definitely would buy again and again. Bought for my best friend as a birthday present, along with the roses. She adored them, and we couldn't get over how stunning the rich golden flowers were and how beautifully they bloomed while steeping. I ordered both flowers - the Lotus for my mom and the Rose Buds for myself. My mom LOVED the lotus blossoms. It "blooms" so beautifully in the cup! She says its too pretty to drink but always steeps another cup - lol! For myself, I LOVE these Rose Buds - they're the best ones I've personally tasted. They have such a delicate flavor, but aren't overpowering or too "rosey". I love serving this when I have my girlfriends over - it's always a hit! I also like to make myself a pot during the weekends as I cozy down and read a book. I can usually get about 2 nice pots out of one batch of roses. LOVE IT!!! She loved the Lotus Blossoms...which are very beautiful when seeped in hot water. The lotus flower is an important symbol for purity, enlightenment, and rejuvenation in Buddhist and Aureyedic tradition.